The Atlas Mountains are a wonderful destination for families looking to try a multi-day trek for the first time or attempt some more challenging peaks. Within easy reach from Marrakech the they offer a variety of moderate and challenging trails with plenty of interest en-route to keep the children interested. Perhaps the most striking aspect for children will be the traditional Berber way of life in the mountains. It is hard to think of anywhere else within easy reach of Europe which offers such a marked cultural contrast and sense of perspective. It is not unusual to walk through villages with no electricity, where local families wash their clothes in streams and water is collected from the well. Homes are traditional simple mud or concrete built structures and children are often seen out in the valleys tending their families' goats. It is a unique opportunity to give your children a more worldly perspective. On trek you'll be provided with your own small team, including a local (English speaking) Berber Guide, local Berber cook and mule. The mules take the load and all you need to carry is a day pack with waterproofs, camera and water. We provide a spare mule, so the children can take it in turns to ride when they get tired. Your meals are prepared by your cook from fresh ingredients, he'll get ahead of you and set up a delicious cooked picnic lunch at the side of the trail and an evening dinner at the end of the day. The advantage of trekking with your own guide is that we can manage the pace to fit your family and make changes to the itinerary as you go along if necessary. Similarly with your own cook, you can let them know if there is anything your kids prefer not to eat. Accommodation on trek is either camping or staying in village gites. In winter, spring and autumn we would usually use the village gites. These are basic village guesthouses. Your family would have a room to itself to sleep in, but bathroom facilities are shared. Hot showers are sometimes available. We find that generally children prefer varied routes with features such as steep sections, small stream crossings etc. to long flat paths. Regular breaks for snacks and lunch are also very welcome. We also favour routes which offer a plan B in case you find it harder going than you expected. Our favourite Atlas Mountains trek for families: Our three day valleys trek is perfect for families, with around 4-5 hours of walking per day plus leisurely stops for picnic lunches. There is plenty of interest on route, with stream crossings, lots of small Berber villages and some modest passes. The beauty of this rout is that if you find the first day tough going there are options to change the route for the second and third days to reduce walking. We include this trek by default in our family itineraries, but are happy to swap for a different option if preferred. 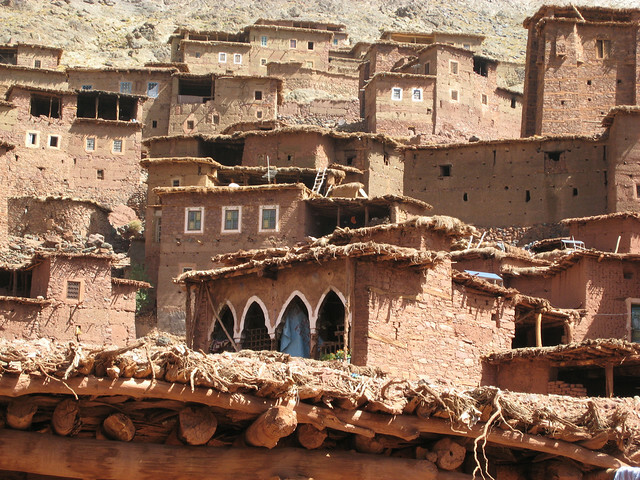 With three days you can get far away from the relatively developed trailhead town of Imlil to see some of the more traditional Berber Villages. A challenging trek for teenagers: If your family is up for a challenge, our four day Toubkal trek offers the best of both worlds with traditional Berber villages, beautiful valleys, stunning high altitude passes and the summit of North Africa's highest mountain, Toubkal. Something more adventurous: Further afield than the Toubkal region, Ait Bougmez is even more untouched, with some wonderful scenery. The Ait Bougmez traverse is a fantastic longer trek for families wanting to get (further) away from it all on a longer trek without a any high altitude peaks or passes. Two days valleys treks: If you are short of time, then you might want to consider instead a shorter two day one night trek. The walking distances are a little more concentrated and there is less room to shorten the walking days on this option. If basic gite accommodation doesn't appeal: We would recommend using a nice comfortable guesthouse in Imlil (Douar Samra and Dar Adrar are both lovely for families) as a base for several day walks. There are several nice 3-5 hr walk options from Imlil, we provide mules, cook and guide as with the multi day trek, so you can still enjoy a lovely picnic lunch up on the trail. Please get in touch if you would prefer this option. The disadvantage of the 2 days trek and day treks from Imlil is that you don't get quite the same exposure to the traditional villages of the Atlas Mountains as the villages encountered tend to be more developed with road access. We do not have any fixed age limits as children mature at different ages and what may be suitable for one may not be suitable for another of the same age. We definitely recommend that the children are at least used to going for walks at home. As parents it is your responsibility to judge suitability based on the information that we can provide in advance. On trek, our guides are experienced professional mountain guides and may judge that a route needs to be altered based on prevailing conditions and how the you and your children are progressing. Children under 6 Years Old: Your child should be used to going for walks. It would be unlikely that a child under 6 will be willing to complete a multiday trek without some kind of assistance. We do provide an extra mule to ride for families. The mules are always led by their muleteer and we provide riding hats for the children. In judging whether your child is old enough to ride a mule, we ask that you take responsibility for judging whether they are mature enough to respond to instructions and hold on safely. In our experience this is somewhere around 4,5 or 6 years old depending on the child. Our smallest hats are suitable for children with head circumference from 48 - 52cm (if in doubt measure your child's head - start above the eyebrows, go past the temples above the ears and finish at the most protruding point at the back of the head). We believe it is good practice for children under 6 to be accompanied on the mule either by an older sibling or the muleteer. Please note, it is not possible to ride a mule for the entire duration of the trek as we will ask that children walk any steep, uneven or narrow sections of the route. With younger children there is the possibility of their parents carrying them. If you plan to do so, it is crucial that children are kept warm enough (body temperature drops without activity) and that you are confident of your ability to carry them. 6 – 12 Year Old Children: Children older than 6 will relish the opportunity to ride a mule, be rewarded by climbing up the passes and will be intrigued by the different ways of life locally. They usually enjoy chatting to the guide and learning a few words of Berber and Arabic, they will have memories from the trek which will last forever. Please note, it is not possible to ride a mule for the entire duration of the trek as we will ask that children walk steep, uneven or narrow sections of the route. 13 - 18 Year Old Children: These young adults will enjoy the challenge of tackling high passes and potentially the summit of Toubkal. They tend to enjoy spending time with the local guides, who enjoy chatting and explaining their own lives and traditions. If attempting to climb Toubkal, it is essential your child is fit and very well prepared for the challenge. If attempting to climb Toubkal, we recommend your children are at least 12 years old. This is a recommendation, not a an enforced limit as suitability is down to the individual child. Children under 12 can attempt Toubkal, in considering whether this is suitable for your child, it is essential your child is mature enough to communicate symptoms of altitude sickness to you. And of course, it is essential that anybody attempting a challenging trek such as climbing Toubkal is fit, and very well prepared for the challenge.